Visitors to downtown Manteo and its bordering attractions will enjoy stunning, wide open views of Shallowbag Bay, a semi-circle parcel of water that is connected to the Roanoke Sound. 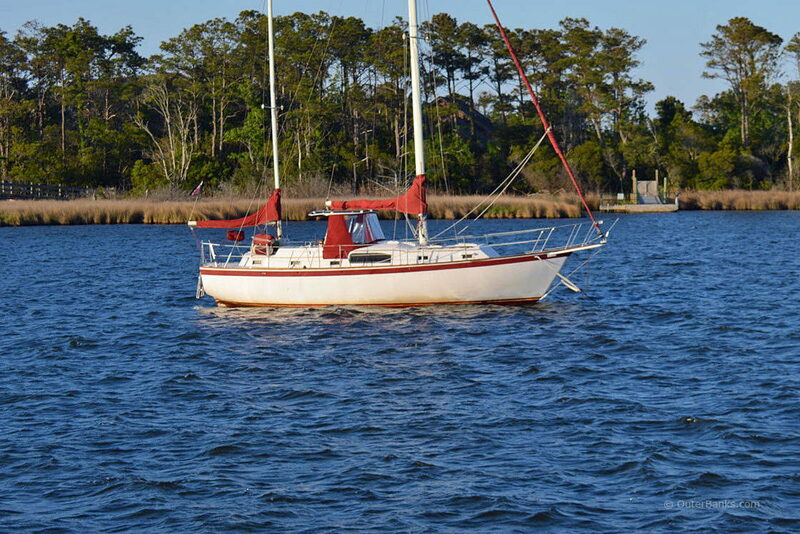 Jetting into Roanoke Island and providing miles of docking space and fantastic waterfront vistas, Shallowbag Bay has become synonymous with boating, either along the expansive downtown docks or small channels that border exquisite rental homes and second homes. Of course, you don't have to be a captain or a yacht owner to enjoy this area, and virtually any visitor to Manteo will appreciate the views, whether sitting at a downtown restaurant, or strolling the border adjoining the water. As a prime example of the Outer Banks' lifestyle on the water, Shallowbag Bay is a perfect destination for visitors who want a day trip that revolves around the water, or a week (or more) vacation that grants them fantastic access to the expansive Roanoke and Albemarle Sounds. Examine a map of Roanoke Island and Shallowbag Bay will stick out like a blue thumb. The enclosure of saltwater is shaped like a semi-circle with a large opening leading directly out to the Roanoke Sound to the south, and the Albemarle Sound to the north. The area gets slightly wider as it gets closer to shore, and branches off to both the Scarboro Creek, and small carved out channels of water that border vacation and residential home communities. The main borders of the bay, however, are located within the most popular and visited regions of Manteo, hugging the borders of the Roanoke Island Festival Park, and the historic downtown area which is lined with restaurants, galleries, shops, and boat slips filled with every small, (and sometimes not so small), kind of vessel imaginable. Because Shallowbag Bay has close proximity to the sound waters, in addition to Oregon Inlet and the Gulf Stream located just 15 miles offshore, the area has become exceptionally popular with private and entrepreneurial charter vessels alike, with dozens of sailboats, charter boats, skiffs and even yachts calling the docks located around the bay's borders a temporary home. Unlike other marinas and harbors along the Outer Banks, Shallowbag Bay is typically protected from the brunt of passing hurricanes, as it is sheltered by the barrier islands located just a couple miles away, as well as the north and south facing parcels of Roanoke Island that give it its cove-like characteristics. This geography means that while there might be a strong wind affecting the oceanside and soundside beaches, the waters within Shallowbag Bay remain generally calm, and ideal docking stations for residents and visitors alike who want to step off the boat, and enjoy the array of Manteo attractions. That's not to say that Shallowbag Bay hasn't had its brushes with major weather events. As recently as 2011, when Hurricane Irene lingered through the Outer Banks, the bay overflowed into downtown Manteo and caused the flooding and months-long closures of a number of favorite shops and restaurants. Eventually, however, the waters receded, and shop owners simply cleaned up as they always do after a storm, and eventually, it was back to business as usual. These extreme weather occurrences are thankfully few and far between, and the majority of visitors to the bay, or temporary maritime residents along the docks, will enjoy the area's calm waters, exceptional sound access, and step-off-the-boat entry to some of Manteo's most popular waterfront restaurants. Essentially, visitors are encouraged to enjoy the waterfront boardwalk, the view, and the collection of sound or sea-worthy vessels of all shapes and sizes that flock to the bay as an elite waterfront home away from home. Shallowbag Bay has had a longstanding role in Manteo's development from a 1580s rustic settlement to the thriving small town that it is today. In the late 1800s, long after the original settlers were gone and years after the civil war conflicts had dissipated, the town of Manteo was formed along the borders of the bay, which served as a nice port for merchant ships and visitors heading to and from Roanoke Island. Homes and businesses were erected, and the county courthouse and government offices were established close to the water's edge, creating a thriving downtown community that was small, but provided residents with everything they needed, including an easy route off the island via the Shallowbag Bay sound entrance. The town of Manteo basically developed around the bay, and a variety of businesses aimed towards pleasing residents and occasional visitors, (including the Pioneer Theater, the nation's oldest privately run theater), set up shop along the waterfront. As the Outer Banks grew, so did the town of Manteo, and more modern shopping centers and residential communities were established along US 64, the main road on and off Roanoke Island until the Virginia Dare Memorial Bridge opened in 2002. These centers included grocery stores, fast food restaurants, and an expanse of homes that made living and working in the small downtown no longer a requirement for new residents, and nearly obsolete. 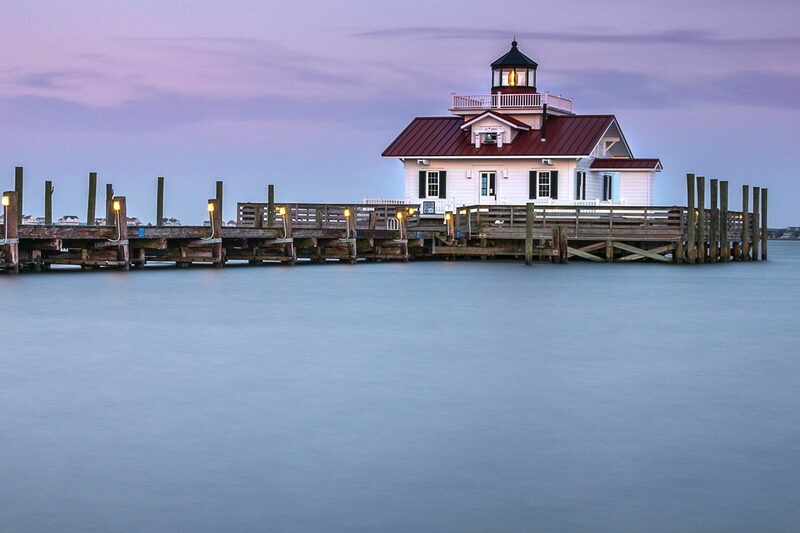 Thankfully, though, the Outer Banks never forgets its history, and the original town of Manteo was simply repurposed as a historical attraction, filled with shops, restaurants, and bed and breakfasts stationed in the historic homes of the area's wealthiest early residents. Developments also flourished around the borders of Shallowbag Bay, with manmade channels carved into the Roanoke Island landscape to allow more boat slips and docks for visitors to enjoy. Today, the regions surrounding Shallowbag Bay are a mixture of elite second homes and vacation rentals, busy downtown shops and restaurants, and the borders of the Roanoke Island Festival Park, one of Manteo's most loved attractions. Visitors are encouraged to explore at their leisure, especially the downtown regions of Manteo, and experience first-hand how a small body of water can cultivate an entire community. There are plenty of options for exploring the Shallowbag Bay area, which range from easy going day trips to vacations filled with waterfront activity. The majority of Outer Banks visitors will visit Shallowbag Bay via a stroll through downtown Manteo or the Roanoke Island Festival Park. Both of these Roanoke Island regions border the lake-like body of water, and offer expansive views which extend all the way to the borders of Nags Head. Visitors are encouraged to stroll along the downtown Manteo waterfront boardwalk, which covers nearly the entire expanse of Shallowbag Bay, and admire the dozens if not hundreds of boats docked along the many private and rental boat slips around the bay's borders. On this walking tour, visitors will spot sparkling yachts, muddy Carolina skiffs, hard-working charter boats, local boat tours, and even sailboats that breeze from one part of the coastal North Carolina region to another. One of the reasons why these docks are so popular is location, as Shallowbag Bay is literally just miles from both the Gulf Stream and the Intercoastal Waterway. Another major reason is simply convenience and entertainment, as the harbors bordering Shallowbag Bay feature plenty of vacation rentals, restaurants, and shopping to enjoy. At some point during a Shallowbag Bay harbor front stroll, visitors will surely notice its most famous maritime resident, the Elizabeth II. 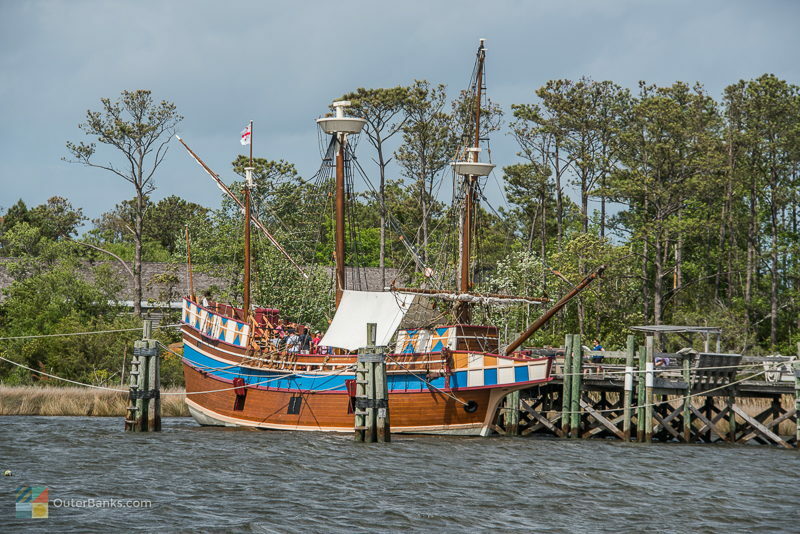 This 1580s replica sailing ship was constructed at the Manteo Boatyard located just yards away as a centerpiece of the nation's 400th anniversary in the late 1980s. Since its construction, it has stood guard at the northern edge of Shallowbag Bay, welcoming Roanoke Island Festival park visitors, and invoking a gasp of surprise from unsuspecting downtown Manteo visitors. While Manteo visitors can certainly walk the expanse of the waterfront docks and enjoy the miles of views, an easier way to take in the scene is via a fantastic meal at one of the local downtown Manteo restaurants. A number of established restaurants can be found along the borders of Shallowbag Bay, serving up fresh seafood caught from the neighboring village of Wanchese, and presenting some of the best open water views in all of Manteo. Day-trippers from the barrier island communities as well as visitors who are docking for the night or two will appreciate the fantastic cuisine, the coastal atmosphere, and the miles of vistas that span across Roanoke Sound and beyond. Visitors who intend to stay for a night or more, and are arriving via a private vessel, should research their vacation rental options close to the docks. 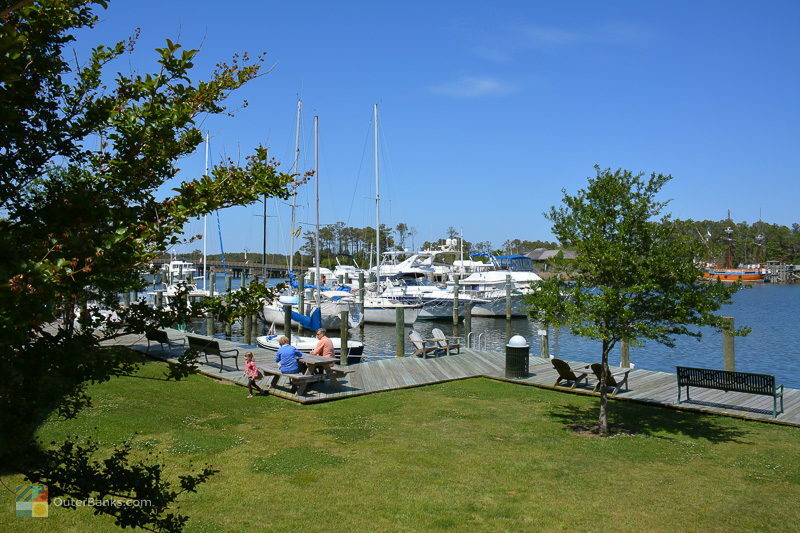 A number of boat docks in downtown Manteo are available to rent on a daily or weekly basis, and are often close to some of the area's best restaurants, inns, and bed and breakfasts. 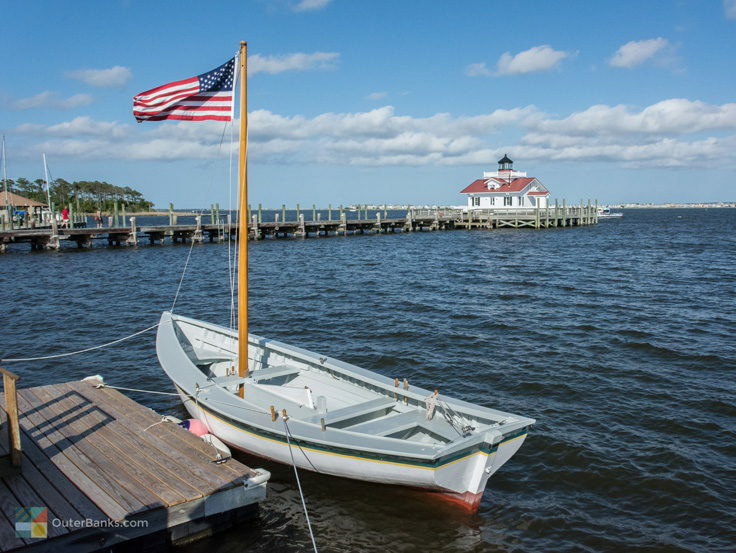 For a weekend in a charming coastal community that encapsulates small town life on the water, a sailing or boating trip to Manteo is sure to be an exceptional weekend excursion. In addition to slips and accommodations offered around downtown Manteo, long-term vacationers are also advised to check out the local rental homes and accommodations to be found around the southern portions of Shallowbag Bay. There is a Shallowbag Bay marina that is open to members, residents, and visitors alike, as well as a selection of luxurious vacation homes that feature a host of elite amenities including private boat slips, hot tubs or pools, and plenty of bay-facing decks. For an elongated vacation around Shallowbag Bay, look into the vacation rental homes and townhouses that border this area, and be sure and bring the boat along. With exceptional sound access, ocean access, and Intercoastal Waterway access, Shallowbag Bay is an ideal pit stop for mariners on an extended vacation. The best way to visit Shallowbag Bay for vacationers is via the historic downtown Manteo waterfront and Roanoke Island Festival Park. Both of these areas border the bay, are open to visitors of all seasons, and feature some of the best landscapes and attractions on Roanoke Island. Cozy up for a harbor front cocktail at a bayfront restaurant along the downtown boardwalk, or take a tour through the Elizabeth II, which is consistently stationed in the Shallowbag Bay waters. Regardless of how you spend your time, you're sure to find ample attractions and activities that never venture too far from the borders of Shallowbag Bay. It's not hard to comprehend why Shallowbag Bay has become a focal point for Roanoke Island residents and visitors alike. As the original body of water that modern downtown Manteo was built around, and a catalyst for vacation rentals and modern marinas in the heart of Manteo, Shallowbag Bay has been providing its explorers with acres of waterfront entertainment and amenities for generations. On your next Outer Banks vacation, take a moment to explore the calm, popular, and often busy waters of Shallowbag Bay. With dozens of vessels cruising in and out of its sound entrance, and open expanses of views to take in, a trip to downtown Manteo and Shallowbag Bay is sure to be a relaxing highlight of any Outer Banks vacation.